All throughout the Bible, we see that wisdom is the real deal when it comes to spiritual must-haves. I like to think of it as the little black dress of faith. An essential must-have for every Christian woman to possess and wear. And surely one that we all look good in! But in today’s world, it can be tricky to make wise decisions and choices. We’re surrounded by foolish and conflicting messages. Messages that oppose the wisdom of God as revealed in Scripture. We get hit from all sides with opinions, posts, and tweets about what people have and want and do—and about what people think is right and wrong. They write it on signs and walk picket lines in an attempt to sway us in their direction. They Instagram it, pin it on Pinterest, send e-petitions to our in-boxes, and blog about it. And then there’s the media that screams like a colicky baby, demanding that we take note of the angle that they are trying to sell as acceptable behavior. One thing’s for sure, there’s a wide difference between the wisdom of God and the wisdom of the world. When I say wide, I mean Grand Canyon wide. I mean the distance-between-the-east-coast-of-America-and-the-west-coast-of-Europe wide! Does that sound like the world to you? Pure? Peace loving? Gentle? Willing to yield? Full of mercy and good deeds? Fair and sincere? I think not. Keeping these truths in mind helps me as a friend. When I’m tempted to vent my frustration about that other person, God’s wisdom reminds me to be a woman of peace. It helps me as a Jesus follower. When I’m tempted to read a book or watch a movie that is fifty shades of compromise, God’s wisdom reminds me that I’m to be a holy, pure vessel for Him. Here’s a refreshing truth: When the world shouts its ways that are contrary to the wisdom of God, I have a choice. I really do. I might not feel like it, but I do. I get to choose my response even when the pressures of political correctness and tolerance squeeze hard. Even in my workplace. Those pressures are indicators that I need to address the issue and not run from it or cave in to it. My behavior is my choice, no one else’s. And I want my choices to align with the ageless wisdom of the all-knowing God. So I choose to put on my little black dress of faith. And some cute shoes, of course! Lord, I want Your wisdom. Please direct my choices, my behaviors, and my heart. Forgive me for the times when I look to others or to myself when I should be looking to You. Where do you want it to be? Swing by my blog or Facebook page and leave a comment. Let’s discuss this as a community today. 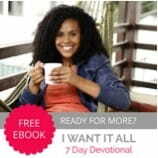 Today’s post is an excerpt from Gwen Smith’s book, I Want It All. C’MON OVER! I’VE GOT A GIFT FOR YOU! Since we are rebuilding our home after a house fire I figured I’d also rebuild my cyber home—my website. Why not? I’m already going a bit crazy. Might as well go all in! My home is still several months away from being livable, but my website is all ready to move in. I’d love for you to come by GwenSmith.net for a visit. I’ve got the welcome mat out just for you! I can’t serve you coffee and brownies, but I can offer you another goodie that’s even better…a 25% OFF coupon. And you don't even need to take your shoes off. For a limited time, use the COUPON CODE NEW25 and enjoy 25% OFF any purchase of $20 or more from the new store!